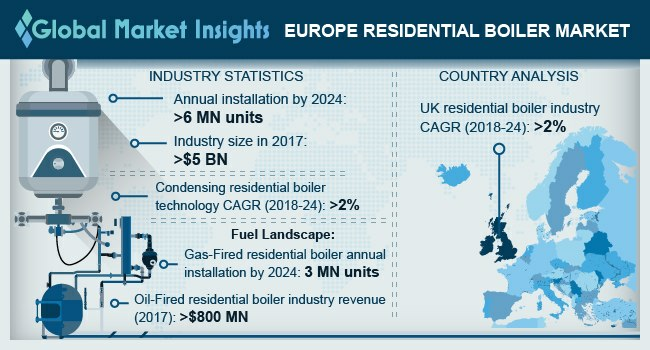 Europe Residential Boiler Market size will surpass USD 6 Billion by 2024, as reported in the latest study by Global Market Insights, Inc.
Europe residential boiler market is set to witness strong growth on account of increasing demand for space heating coupled with focus toward resource optimization and limiting carbon footprint. In line with global initiative to minimize CO2 emissions, the European Union in 2015, introduced Eco-design Directive pertaining to solid fuel boilers with an aim to minimize the negative environmental impact of GHG emissions. In 2017, Germany accounted for over 10% of Europe residential boiler market share. Upgradation and expansion of existing residential facilities along with shifting trend from traditional to green infrastructure will drive the product deployment. For instance, in 2013 German Energy Saving Ordinance (EnEV) was amended that lays down the energy performance requirements for existing and new buildings. Rising consumer awareness toward installation of energy efficient heating systems along with robust gas supply infrastructure are some of the key factors which will further drive the business growth. Gas fired residential boiler market will witness robust growth on account of expanding gas infrastructure coupled with ongoing shift toward deployment of energy efficient heating systems. Natural gas is one of the primary fuels consumed by residential sector to meet growing heating needs. For instance, as per European Commission, 37% of energy consumed in the residential sector was fueled by natural gas. Ongoing investment toward expansion of existing gas supply networks and declining fuel prices will further augment the business growth. Condensing residential boiler market is anticipated to expand over 2% by 2024. Stringent government mandate to curb carbon emissions from residential establishments along with rising awareness toward energy efficient heating systems will drive the industry growth Ongoing investments toward construction sector along with rising culture of nuclear families will further fuel the industry growth. For instance, according to European Commission in 2017, single family households accounted for over 30% of the residential establishments. France residential boiler market was valued over USD 600 million in 2017. Resurgent economic growth post 2008 recession has resulted in an increased demand for HVAC equipment including residential boilers. Growing migrant population and subsequent increase in residential establishments will drive the product demand. Water-tube residential boiler market is predicted to witness gains over 2% by 2024. Increasing deployment of underfloor heating units along with the product’s abilities including high pressure handling, quick response and low radiation losses will increase their adoption across the industry landscape. Key participants of the Europe residential boiler market comprise NIBE, BDR, Viessmann, Hoval, Groupe Atlantic, Immergas, Bosch, Ariston, Daikin, Siemens, Weishaupt, Navien, Fondital, Vaillant, Lennox, ACV, Wolf, Ferroli, amongst others.